There’s a fine line, when you encounter work close to your own, between the excitement that someone else considers your little area worth working on, and the worry that they might already have written the work that you are struggling to put together. This happened for me most recently when reading Kevin Anderson’s Marx at the Margins. As I’ve been trying to write about ways in which class reductionism misrepresents Marxism, Anderson’s detailed investigation of Marx’s writings on race, nationalism, and non-Western societies looked like it might render my gestures in that direction irrelevant. Luckily for me, Anderson’s book is actually the best sort of work to encounter, as it contains a huge amount of material on which one could build, while leaving enough theoretical space for others to do that building. Indeed, it is this combination of Anderson’s great aggregation of material with his comparatively sparse theorization of it that leads me to some thoughts about methodology for those of us attempting to construct theory through close dialog with particular texts and authors. Marx at the Margins: On Nationalism, Ethnicity and Non-Western Societies covers a huge variety of Marx’s writings on these topics from 1850 up until his death. Some of these are fairly well known, such as the 1853 articles on India, the Grundrisse, and his 1881 letter to Russian socialist Vera Zasulich; others are less well known, such as 1850s writing on China and Indonesia and the changes Marx made for the French version of Capital; finally, Anderson covers some currently unpublished late notebooks of Marx on pre- and non-capitalist societies. In one sense, I suppose, there’s nothing terribly surprising in all this material: we see Marx’s interest in the global nature of capitalism and his tracking of different revolutions across the world. What Anderson provides, though, is a much wider context which makes it harder to consider these well-known writings as aberrations or mere side-interests of Marx; rather, questions of colonialism and ethnicity were central to Marx’s work from the 1850s onwards. Particularly interesting, I thought, are the discussions of the relationship between anti-slavery campaigns in the US at the time of the civil war, and then campaigns against British rule of Ireland, and the development of working-class politics in England; the struggle of the US north against slavery, and of the Irish against British rule, where enthusiastically embraced by that section of the English working class which was also most interested in Marxism (and most influential on Marx). This suggests a much closer connection between Marx’s theoretical interest in race and nationality, and his practical engagement in politics, than standard accounts would have it: it’s not just that Marx was invested in non-class forms of struggle, it’s that the working-class struggles we take to be primary for Marx were themselves deeply enmeshed with struggles expressed in terms other than class. Where the book maybe disappoints, though, is that it only suggests this connection, doing less than I would like to really establish it. The method of the book is a kind of chronological aggregation. It is organized into thematic chapters, with each chapter presenting a series of texts to us in a strictly chronological order. This ordering does provide some implicit support for one of the main arguments of the book, namely that Marx’s position changed from a fairly Eurocentric, developmentalist, position in the Manifesto, to a “multilinear” position in later work, inasmuch as we are supposed to be able to see the steps of this development in the chronological selection of texts. The problem, though, is that this support is largely implicit: Anderson doesn’t give us much of an account of what exactly changed in Marx’s work, and still less of why it changed. 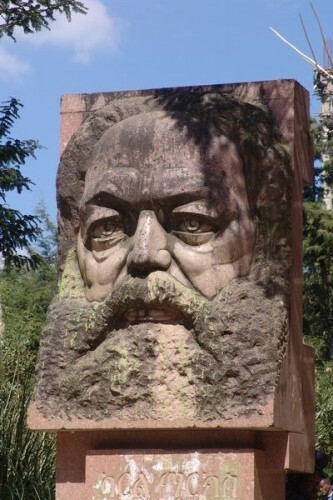 What we get is mostly descriptive, but doesn’t address the question of what aspects of, and changes in, Marx’s theory underwrote this changing approach to the non-Western world. This resistance to theory is, I think, the cause of a tendency to moralism which unfortunately mars the book, especially in its discussion of Marx’s views on race. In the context of Marx’s attitude to Poland and Russia, for instance, Anderson quotes Marx describing something as “characteristic of the Slavonic race” and writes that this is a rare example of Marx using race as an explanation. However, at this point Anderson has just quoted a number of places where Marx attributes various things to Slavic culture, and the only distinguishing feature of this later sentence seems to be its use of the word “race.” Anderson doesn’t investigate the relationship between racial and cultural explanations here, which is a problem because race is a concept that has mixed biological and cultural explanations in a range of different ways, and I don’t think it’s at all clear that the categories worked the same way in the 1850s as they do now (for example, Marx’s writings here predate the publication of The Origin of Species, which had a huge influence on the biologization of race). A similar problem occurs with Anderson’s discussion of Marx’s use of racist terms, especially the n-word, in his discussion of the US Civil War. Anderson makes the sensible point that Marx used (what we would consider) racist language to make (what we would consider) anti-racist points, but doesn’t consider that this contradictory relationship between what we would consider racism and anti-racism may not map very cleanly to the role of race in Marx’s own thinking; it’s not really clear that “racist” or “anti-racist” are roles that would have been open to Marx. Anderson’s method is aggregative again here, although in a slightly different sense. Various contemporary standards are laid out (racism, eurocentrism) and a score is totaled up as Marx adheres to or violates these standards. The reason I call this as moralism is that it employs standards that are external to Marx’s work without considering how these standards might be modified to bring them into dialog with that work: in the case of race, we should ask what conception of race Marx had (or, in his context, could have had), and how that informed his writing; in the case of eurocentrism, again we should ask how understandings of “Europe” relate to Marx’s analysis of capitalism (and Anderson certainly does do us a great service in showing that, if Marx did privilege Europe, it wasn’t simply through ignorance of the rest of the world). Which brings up the methodological question I mentioned at the beginning, which could be put: what is the point of studying the work of an author? One could legitimately distinguish between a theoretical approach, in which one attempts to develop ones own theory in dialog with another theorist, and an intellectual-historical approach, in which one attempts to describe accurately the work of the theorist. But it seems to me that even the latter case must necessarily involve a measure of theoretical invention, if one wants to go beyond a pure aggregation of facts of the blandest sort (that a particular text was written at a particular date). To give an account of change in an author’s work, whether an accurate characterization of that change or an analysis of why the change took place, it is not enough to simply present us with the sequence of different expressions of an authors thought, you need to present an account of the theory that underlies these periodic expressions, and this will always involve an element of theoretical work, of construction and not just interpretation. That Marx at the Margins provides a great deal of information which many of us can use for further work of theoretical construction is what makes it such a useful book.